The Double Knockout Rose Bush blooms from late spring to fall, and offers repeat blooms. Grows to 3-4 feet tall and requires no dead-heading: petals fall off cleanly! Quite hardy and will survive and thrive in most climates. Requires far less sunlight than traditional rose bushes, so your location choices are endless. If you love pink roses, this is the rose for you. Imagine being greeted by a blanket of full, pink roses! 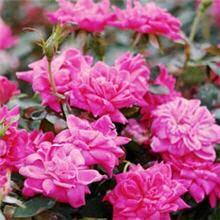 Ideal as a foundation shrub or as part of a border planting. Makes a wonderful hedge, or plant just a few bushes where you want to add color to your landscape.